Organizing and actions to resist the moral and financial bankrupting of the U.S. through wars against the poor, at home and abroad. 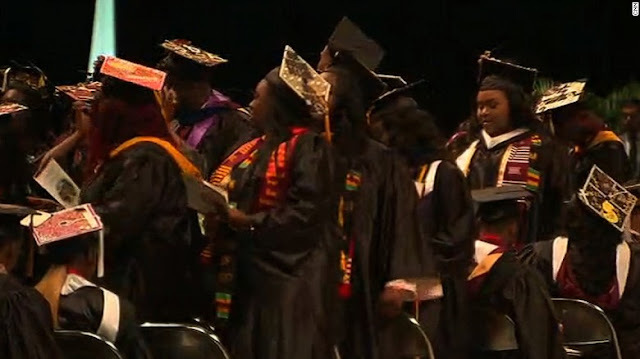 In a sea of bad news this morning, my bright spot was video of graduates at Bethune Cookman, a historic Black college, booing and turning their backs on honorary degree recipient Betsy DeVos. In an ironic touch, a dean who appeared to be angered and no doubt embarrassed by the crowd's reaction to DeVos at the podium admonished graduates to "choose which way you want to go." This followed a threat that if the disturbance did not cease that diplomas would be mailed rather than handed out as they marched in caps and gowns. Celebrating years of hard work to achieve a college degree by protesting an uneducated white representative of the openly racist regime of the demagogue with bad hair seems like making a good choice to me. DeVos is an heiress of the Amway fortune and sister to notorious Pentagon contractor Eric Prince. Famously uneducated herself, she was instrumental in harming public education systems in Michigan and Texas before ascending to the federal post of Secretary of Education. She is an avowed enemy of public education favoring privatization schemes and charter schools over fully funding schools that serve all children. Want to see charter schools go away real fast. All public schools declare they will no longer serve. Leave all education up to charter schools. With no public schools around to provide funds for charter schools and now, charter schools will have to take ALL students - the bad with the good, they will no linger want to stay in a business that doesn't provide them a tidy little profit. Awesome Inc. theme. Theme images by lishenjun. Powered by Blogger.